The JBL On Stage is a little powerhouse with great sound for the desktop. The main problem with the On Stage is that it doesn't have batteries, so you are a bit limited as to what you can do with it and where you are able to use it, but it's excellent as far as it goes. A cable dock connector port is around the back, so you can sync with iTunes while docked in the On Stage. Also behind the main outward panel of the JBL is the power button, the power input and a jack for a secondary audio source. Four speakers sit in the doughnut, two facing each flank. The sound is wonderful. Given the unit's size the volume doesn't go high and starts to distort badly if you push it, but for reasonable volume output in small rooms or next to you on the desktop, it's great. We reviewed the On Stage, which is remoteless, but the On Stage II is replacing the line and comes with a remote at no extra cost - besides that, the spec is identical. At the lower end of the price range, the main competition is from the Logitech mm50, and deciding between them is very difficult indeed. Perhaps the Logitech edges the JBL out due to its better range of connection options and, of course, the battery option. 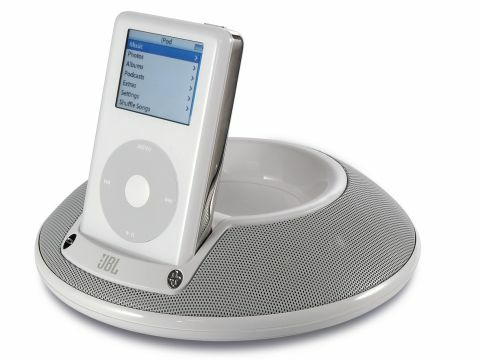 One thing that is worth mentioning is we noticed that the left and right channels on the JBL can cut out if the iPod wobbles even slightly, but JBL has thrown in a wide range of iPod trays to minimise this.